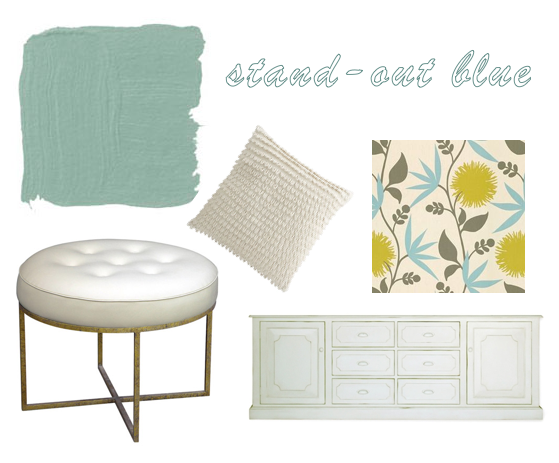 Stratton Blue from Benjamin Moore: Three Ways! Stratton Blue (HC-142), a historical color from Benjamin Moore, is a perfect blueish greenish color that is fresh and classic. Depending on the light, the shadows, and the surroundings, it’s virtually impossible to tell if the color is blue or green; that’s a huge part of its charm. Over the past year I’ve had THREE! clients use this paint color in their homes, and they all have made it their own via different interpretations and accents I’ve recommended. I’ll be building my online portfolio over the next few months, and you’re sure to see some pictures when all is installed, accessorized, and shot, but for now here is a sneak peek at some mini-boards of the different ways that Stratton Blue can shine. Let it stand on it’s own! Stratton Blue is a bold color, so pairing it with crisp white is a great way to showcase it on the walls. A single pattern or pillow incorporating some vibrancy is enough. This mini-board is for a guest bedroom in a DC row house. 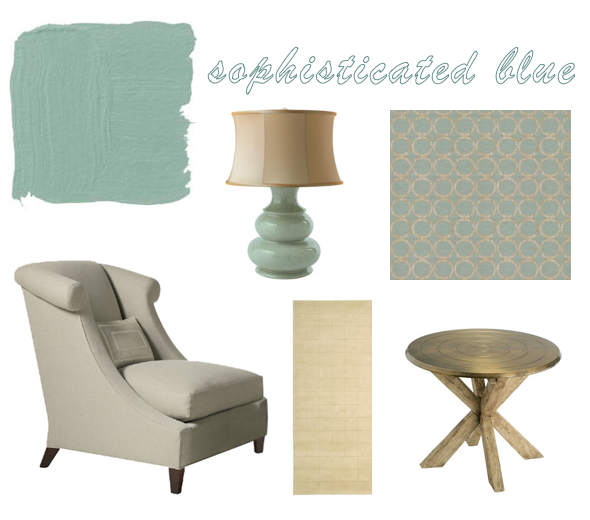 Let it set the tone with detailed, textural accents! Neutrals of all shades and materials deepen the complexity of a space, and with a sophisticated shot of color the room becomes both refined and relaxed. This mini-board is for a master bedroom in a Capitol Hill home. Let it take the beautiful backseat with contrasting complements! 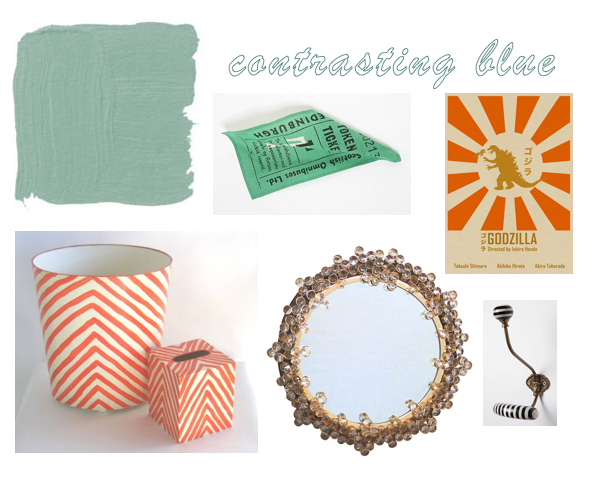 Stratton Blue’s ambiguous blue-green hue is the perfect pair for an equally non-committal pinkish-orange. This mini-board is for a powder room in a Northern Virginia home. Full disclosure: this “client” is my mother, and the only commitment she’s made so far is the paint color…anyone want this powder room? If so, let’s DO IT! ← Memorial Day Cake Plates! Jessica, these colors and boards are FABULOUS! This happens to be one of my favorite colors as well, but I love your pairings and presentation (as always). Thanks, Catherine! I’m glad to hear that you are fond of a non-gray! I LOVE all three of these mini-boards! I have a big old house that my husband and I are renovating and I’ve been thinking that I wanted to do something funky with the powder room. I’m loving that 3rd combination. I really want to use flavorpaper’s city park wallpaper in the room but now I’m thinking about your color scheme. Of course I love that third color scheme, but flavorpaper is pretty neat as well. I’m glad you’re willing to be adventurous in your new house – congrats! I am using Stratton blue on the exterior of my lake house with Simply White trim. I have shutters and can’t find a color, other than navy. I need help! There are so many variations of navy. Can you suggest colors?